The city of Montreal possesses a very original and interesting cultural history, an intermingling of the past which traditionally includes three majorities who are the French, the English, and Jewish cultures. Although, in recent times - mainly due to language woes - many Anglophone Jews have exiled themselves to seek work outside the province of Quebec. Because of this, numerically, there are now around 90,000 Jews who claim Montreal as their home, therefore demographically placing them seventh in rank after those other ethnic groups outnumbering them (including the Italian and Arab populations) (1). For the most part, historically, the English arrived since James Wolfe's victory over Montcalm at the Battle of the Plains of Abraham in Quebec City in 1759, a defeat which paved the way for an assault on Montreal the very next year... The fall of Quebec therefore marks the end of French rule in North America, with the exceptions of Louisiana and the Islands of Saint-Pierre and Miquelon. Thus, this is where a large part of English-speaking Quebecers find their origins, because it is in the course of the second half of the 18th century that, under the British regime, United Empire Loyalists and Anglo-Scot Protestants communities arrived on the Island of Montreal and decided to stay. These early Anglophone Protestant communities did extremely well for themselves, prospered, and would finally come to represent Quebec's upper class, the ruling elite that would last until as recently as in the 1960s when the Révolution tranquille (Quiet Revolution) brought about many changes in the Province of Quebec. Following the death of Maurice Duplessis, in 1959, secularization ensued, and since then many more changes would transform Quebec society. Most notably, these social upheavals brought about Quebec nationalism which would set the stage as early as in the 1970s for all of the sovereignty or independence/separatist movements that exist to this day. These days, in Montreal (and the rest of Canada), since secularization transformed our vocabularies we no longer say English Protestant and French Catholic societies or cultures, but rather instead the correct terms seem to be Anglophone and Francophone. There exists, however, aside from "the Anglophone and Francophone communities in Quebec," those who, as Ira Robinson puts it, "were classically referred to as the two solitudes, it could be said that the Jews of Montreal in this era formed a third solitude of their own" (2). From less than 500 Jews reported to live in the Province of Quebec in 1871 (Robinson 2013), at the time of the Canadian Dominion Census was taken, from this point "[t]his situation would change drastically at the very end of the nineteenth century" for "[a]t that time a massive wave of Jewish emigration from Eastern Europe, seeking economic betterment and equality of opportunity came to Canada as it came to the United States, England, Argentina, and other countries hospitable to immigration" (ibid.). This new Yiddish-speaking cohort of Jewish immigrants caused the Jewish population of Quebec to increase by more than 800% between 1901 and 1931, from approximately 7,000 to 60,000. These immigrants, who quickly made Yiddish the third most prevalent language in Montreal, after French and English, were at first poor in material resources, but rich in both cultural heritage and in a desire to put down roots in their new home. For a variety of reasons, the Jewish children of these newly established communities would integrate themselves into the English-speaking Protestant schools. Hence, the majority of Jewish Montrealers are Anglophones, with only about 25% of the 88,500 Jews living in Montreal claiming French as their mother-tongue (3). The Francophone element of the Jewish communities in Montreal actually form a part of a later wave of immigration - this time in the 1950s from North Africa - where from French-speaking post-colonial régimes - the Sephardim Jewry of this period came to Canada and moved to Montreal where until then most of the Jews there were in fact European-cultured Ashkenazim (Robinson 2013). All this to explain why, as an integral and undeniable part of Montreal's culture, smoked meat sandwiches and bagels abound, along with cream cheese and lox, knishes, schnitzels, gefilte fish, among other Jewish culinary delicacies. A smoked meat sandwich is therefore in bon Québécois for the native Francophone Montrealer just that - meaning it is un smoked-meat sandwich. Bagel does not translate either, for it is simply un bagel in Canadian French, nothing more nothing less. Although the former (smoked-meat sandwich) is composed with English terms that are used to describe something that certainly does not find its culinary origins in England, regardless, due to many socio-historical circumstances in Montreal's rich past - this is the name of this cultural reality that the term connotes. And the same goes for bagel - it just doesn't translate. A bagel is a bagel, and that's that. It's like trying to translate the Italian term pizza. Hence, the terms stay - in English the words bagel (Yiddish), pizza (Italian), and even lox (Yiddish) are found in most dictionaries. These terms are pregnant with cultural meanings that extend far past their language of origins or the words used to express the reality of the "eatable thing". These typical Jewish foods that the terms bagel, lox and smoked meat sandwich (or un sandwich smoked-meat if you prefer) represent are not accepted, interestingly, as Canadian words - or even at the very least Quebecois terms - despite the presence of the bagel in Montreal for over a century now. In fact, I cannot help but cringe when I look up the etymology of bagel in North American French dictionaries. For instance, in my old Dictionnaire du français plus (1987 ed.) which is supposedly a French dictionary reflecting la réalité nord-américaine de la langue, in its pages, the Canadian and/or Quebec terms which professors from the Université Laval, the Université de Sherbrooke, along with researchers from the Trésor de la langue française au Québec have included some of these terms commonly used on the streets of Montreal. However, none of this highly esteemed body of professionals interestingly have even considered that the reason most Quebecois know of the existence of the bagel is because of the hundreds of bagel shops to be found on the Island of Montreal where the Jewish community is to be found. In their "bagel" entry in the Dictionnaire du français plus, the root of the term is correctly given as being Yiddish in origin, but "par l'américain" (meaning by way of American English) is added after it. Similarly, the "smoked(-)meat" gets the same treatment, for the origin is simply "mot américain" (an American English word). The obvious question that begs to be answered: Have the Québécois (and other Francophones in Canada) been alienated to the point that if it isn't French then it must be English? I sincerely think so, for as "pastagate" has taught us, or at least for the language police of the Office québécois de la langue française (OQLF) and their language inspectors, the term "pasta" appears not to be Italian but rather it comes across as an English word to avoid (a bad anglicisme) even if it is an undeniable Montreal staple in the sizable Italian community who have also made their own important cultural contribution to the city's eateries and foodstuffs. It evidently goes without saying that the Jewish brit (the Jewish covenant of circumcision) is not in my Dictionnaire du français plus nor is bar mitzvah (or bat mitzvah for a girl), the popular Jewish coming of age rituals which I have no doubt one would be hard-pressed to find someone in French Canada who is not familiar with the term, let alone many Quebecois Montrealers who have already been invited and been to one. (I wonder if Pauline Marois has ever been...) Who gets to decide what's French language and what's not - I will tell you one thing for sure, it is certainly not the Office québécois de la langue française, but rather it is the people who speak it. 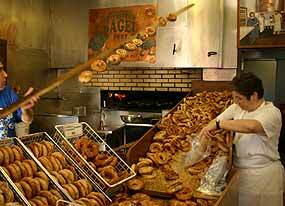 Since 1957, the St-Viateur Bagel & Café (Monkland) has served freshly baked bagels in Montreal. I believe it was in Richard Handler's book (http://books.google.ca/books/about/Nationalism_and_the_Politics_of_Culture.html?id=fOukKyHqOZUC) that he posits the notion that with the majority of Quebec's population living close to the US border, that indeed the culture and language have more to fear from the American invasion than Canadian English/culture. Perhaps this is why bagels and smoked meat are being classified in this way. In any case, I hope the insanity of the language police gets an overhaul. I love Quebec and the French language (used to be fluent myself! ), but as a French teacher from France that I used to know pointed out, they use a lot of Anglicisms in France because the concepts didn't exist in French culture. Any linguist will tell you that a society won't develop words for which there is no concept. This reminds me of a funny story, though, of when I was in Mexico, a restaurant tried to translate polenta, because I guess they didn't know we use that in English, and translated it as "creatched weath", apparently their spelling of cracked wheat! Creatched wheat, that's funny. I have to admit though, the OQLF does have an excellent site where at Le grand dictionnaire terminologique (http://gdt.oqlf.gouv.qc.ca/) when you punch in a word like "bagel" you actually do get the following definition: "Petit pain, d'origine juive, en forme d'anneau fait avec de la pâte levée qui est pochée avant d'être cuite, d'où sa texture à la fois dense et moelleuse." Their recommended spelling is "baguel", although they don't provide its etymology. And they also have included in it the definition for "bar mitzvah" (fem. bat mitzvah), which Le Robert - the more popularly and widely used French dictionary (from France) does not include, and this despite that the most important Jewish community in Europe is to be found in France. Pastagate: Can someone translate pizza for me ?